On Thursday 19th April, we will be exhibiting at the Kent 2020 Exhibition at the Kent Event Centre, Detling. We’d love to talk to you about your project, completely free of charge and with no obligation. 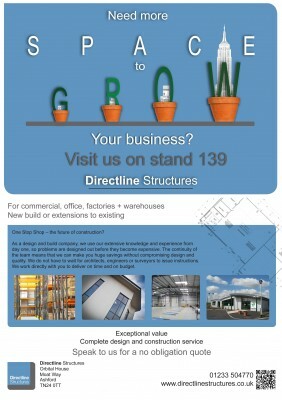 You can find us on stand number 139, on the central walkway opposite the coffee lounge. There will be over 300 Kent businesses exhibiting on the day, covering a vast range of services from Construction, to Vineyards, the Army, and Universities; you’ll be sure to find everything you are looking for. There are also several exciting keynote and guest speakers, including entrepreneur Lara Morgan, professional poker player Caspar Berry, Ski Sunday presenter Graham Bell, and Paul Carter, Leader of the Kent County Council. Book your exhibition visitor pass here. For more information about the exhibition, visit the Kent 2020 website.